Welcome to Augusta Creek an enclave of twenty eight, luxury, single family villa homes. Homes in Augusta Creek were built between 1997 and the year 2000. Home sizes in Augusta Creek range from about 2900 to just under 4200 square foot living area. Every home in Augusta features a private swimming pool and a lanai view of either the famed golf course of Bonita Bay or lake views. 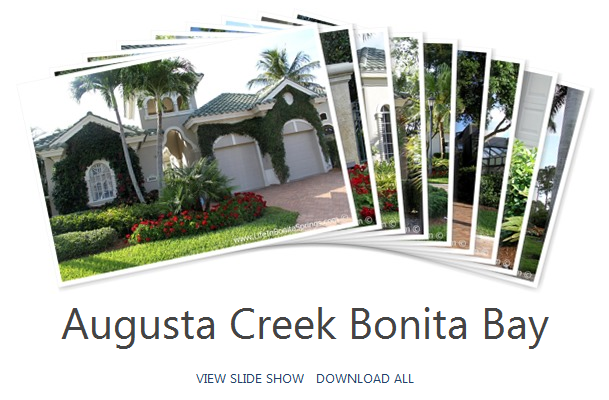 August Creek at Bonita Bay consists of only one single street with a cul-de-sac end, Augusta Creek Court. The street is hand laid cobblestone brick pavers which add to the Mediterranean feel of the street. The homes are built with the attention to architecture quite similar to Coconut Isle at Bonita Bay. August Creek is located in the center of Bonita Bay near Spring Ridge at Bonita Bay. It’s just a short walk to Spring Creek Park, one of four private parks set aside for use by Bonita Bay residents. The community is now built out and there are is only resale real estate available in Augusta Creek. Similar real estate offerings in Bonita Bay would be Siena at Bonita Bay, Bay Woods at Bonita Bay and Hidden Harbor. Enjoy all that Bonita Bay offers with access to a private marina, beach facilities, miles of biking and walking paths, multiple parks and the member-owned private golf club featuring five 18-hole golf courses, tennis & fitness facilities.